The news arrived early yesterday morning: the Chicoutimi Saguenéens pilot in recent years, Yannick Jean, has resigned from the Chicoutimi team's board of directors. Behind the closed doors, it is mentioned that Jean could find a job at a higher professional level. The club's management team took the opportunity to announce the appointment of Cedric Dumas as GM of the team. He is confident that he can lead the team to great things. The priorities of Dumas include finding a head coach: Yannick Jean held this position with that of general manager. Let's remind that the training camp of the team starts in a week to the day, here in Chicoutimi. I received this call while I was sitting quietly on a terrace on Racine Street in Chicoutimi. Indeed, I had to hang up with Éric Claveau, my boss at the Marquis de Jonquière, in the Ligue Nord-Américaine de Hockey. It was now ten years that I worked for this semi-pro organization very popular in the region. My post as assistant manager with Marc Boivin, was a very rewarding experience, crowned with two Coupes Vertdure. But how could I say no to my friend Marc Denis, shareholder of Saguenéens Chicoutimi, who offered me the position of general manager of the team! It is with pride that I accepted his offer, with one goal in mind: to bring our team back to glory. The Chicoutimi Saguenéens franchise was granted for the 1973–74 season. The team's name, Saguenéens, literally means "People from the Saguenay." The current junior team is only the most recent to use the name. The "Sags," as they are popularly nicknamed, have won the President's Cup twice in their history, in 1990–91 and in 1993–94. In both instances they advanced to the Memorial Cup, failing to advance past the round-robin stage on each occasion. The Sags also participated in the 1997 Memorial Cup, as the host Hull Olympiques had won the QMJHL title that year; the Saguenéens also did not advance past the round-robin that year. Finally, the Centre Georges-Vézina hosted Memorial Cup festivities in 1988, but the team did not participate as then-current QMJHL rules forced the host team to make it to at least the President's Cup final, which the Saguenéens did not do in that year. Among the players who donned the uniform, we find George Vézina, Félix Potvin, Guy Carbonneau, Alain Côté, Gilbert Delorme, Marc Denis, David Desharnais, and more recently, Charles Hudon. The team plays its games at the Center Georges-Vézina, named in honor of the famous goalkeeper. The star players of the team are German Rubstov, Vladislav Kotkov and Artemi Kniazev. 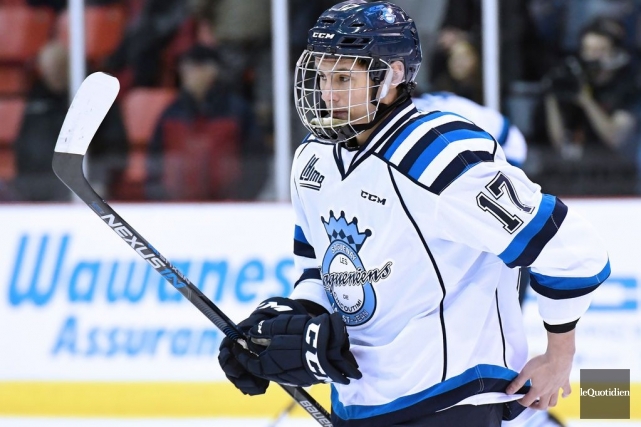 Top prospects include Hendrix Lapierre and Theo Rochette, our first two round picks last year.